Kryps, Henry Hesters, Park- riders, Logan 4&5‘s G&S Cutaway deck with Full Tracks. 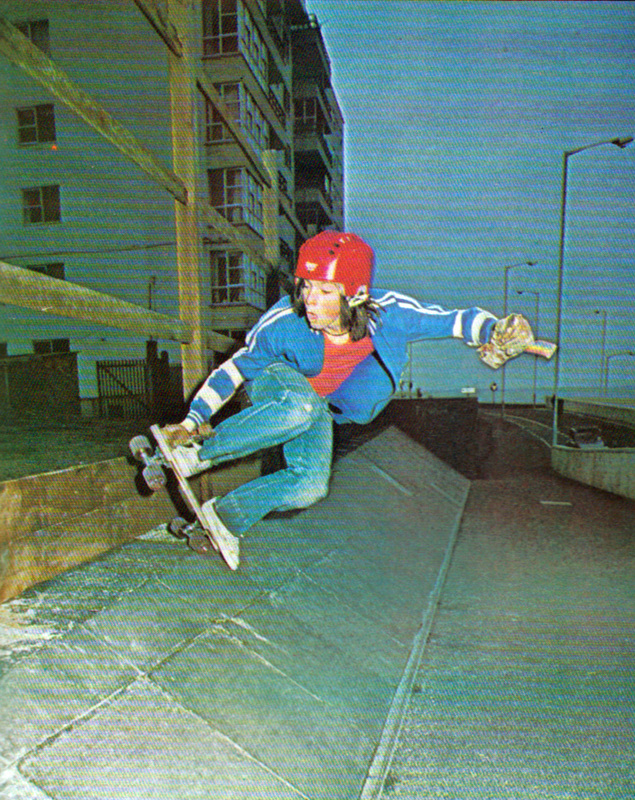 Admires in the States: Jay Adams, Tony Alva, Lonnie Toft, Henry Hester. Admires in the UK: Mark Sinclair, Jeremy Henderson, Jock Paterson, Si Napper, Alex Turnbull. 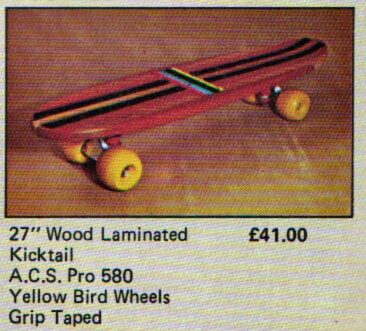 1977 has thrown up a multitude of promising UK skateboard stars. Some have shown tremendous footwork skill, a few have displayed brilliant bowl-busting technique and others have ‘gone for it’ so hard you’ve wondered if they really are totally fearless. One rider straddling all three camps is Simon Napper. Nobody goes for it like Simon. He’s 16 years old, hails from Chelsea in London and he represents almost every rider’s idea of the complete skateboarding machine. 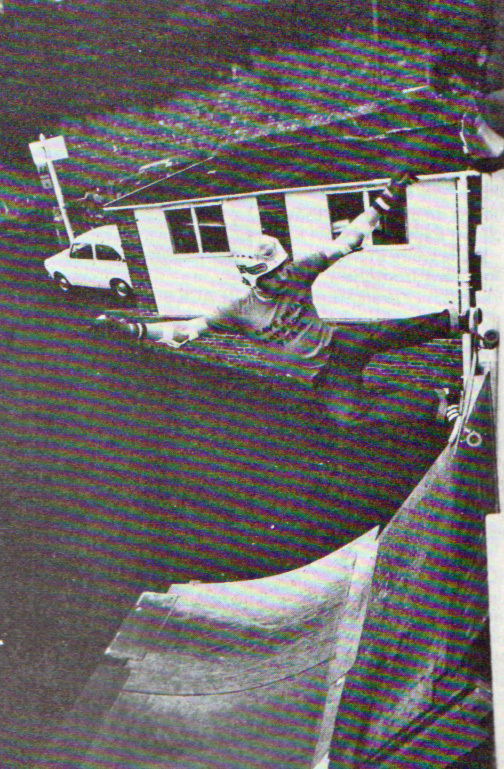 Renowned for his legendary reserves of guts, his mastery over Skate City’s Black Bowl has to be seen to be believed. Lately, rumours have been heard regarding his physical condition. Could his recurrent knee problem force him to cool off for a while – even permanently? 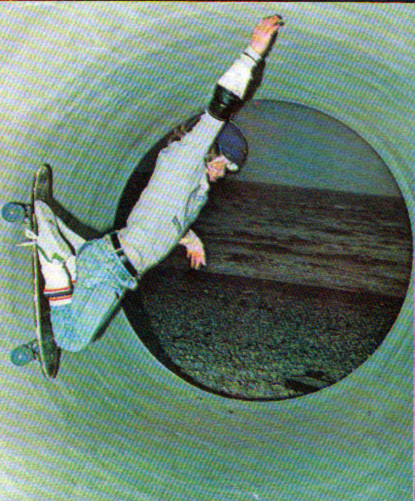 ‘Skate- board!’ magazine’s Steve Kane asks the questions. Simon, how long have you been skating? Just over a year now. . . I started around November ’76. What kind of board did you learn on and where did you use it? Originally I had a home-made board with Tiger Trak wheels and X-Calibers. To begin with I used the South Bank, Primrose Hill and Wandsworth roundabout. Then Skate City came along. What do you think of the South Bank? It was a good place, but then it got really boring – it almost made me stop skating. It’s really limiting. How about Skate City. . . didn’t you have something to do with its design? No, not really. I had a little to do with it, but not directly.. I think it’s great – a good place. What I mean is the Black Bowl is great. . . I wouldn’t bother with the rest of it. The Black Bowl’s original and very nice to skate. To start with it’s radical — plenty of vertical. It’s just a good shaped bowl. Funnily enough it wasn’t‘ actually designed like that originally. That’s just how it turned out. You mean it was a happy‘ accident? Yea. . . l thought the original design was terrible. And I wish the whole place could he 1. organised better. . . it needs more atmosphere. What mistakes have they made that you think other * park builders might learn from? There’s only a select few who can ride the Black Bowl and , lots of the others can only just ride the Red Bowl. And there’s about 5,000 people who can’t ride any bowl, so they’re just left with the flatland. There’s not many people who’ll want to pay the money just to ride flatlend. . . they’ll go to the South Bank. Skateboarding-wise, where do you think the future lies now? America. . . I’m going in March. They’re not all that far in front of us. They’re ahead in freestyle, but in bowl riding, they don’t seem to be doing much more than we are. Who would you most like to meet? 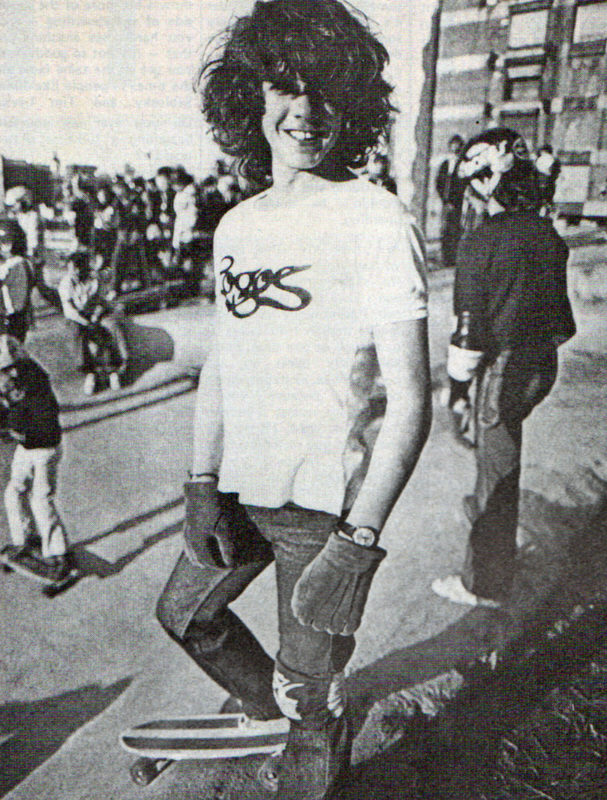 Tony Alva. . . full stop. Why? Well, Tony’s into this really radical stance — a go-for-it stance. And he’s into bowls and pipes which is where my main interest lies. I’d just like to see him skate. . – it looks like he’s really hot. Of course he is commercial, but I’d say less than most of the others. What do you think of the image of American skating. ls it good as it is, or do you think it’s too commercial? It’s good as it is. . . it certainly works okay? What about over here? Right now there’s many people in skateboarding who’ve just jumped on the bandwagon. They’re not in it seriously. l mean, yea, they’re making perks, but they’re cutting corners and costs. Obviously they’re trying to make their money back as quick as possible. If they go on making really bad parks, ‘people are going to lose interest. Are there any parks over here that you’ve really enjoyed – apart from Skate City, which we’ve already discussed? I’ve been to Thruxton and Newbury and enjoyed both. Thruxton was the only one with verticals, but I thought the other was quite fun as well. What do you think of the media coverage skateboarding’s been getting? There’s lots of people been saying it’s dangerous. . .would you say that was fair? That’s a hard question to answer. I mean there’s always ‘old women’ around. if the kids weren’t into skate- boarding you’d still get people complaining about something. What’s your opinion on safety gear? Well, I don’t like wearing it and if I had a choice, I wouldn’t wear it. But I think it should be compulsory. it gets difficult if you start saying when you should and shouldn’t wear it, so in skateparks anyway it should be worn all the time. Do you think it’s just a matter of allowing for bad judgement? When you ﬁrst start, there’s no doubt that everyone should wear safety equipment. As you get better, l don’t think maybe you need it so much. But then, common sense tells you if you’re going for a hard trick, then you should put it on. As I say, I suppose it’s best really to wear it all the time. Do you think skating on the streets should be banned? No, it’s really fun skating on the streets. There’s no need to ban it. Sometimes l prefer skating in the streets to skating in parks. What sort of thing do you like to do in the streets? Sometimes l slalom in and out of people. . . King’s Road is pretty good for that, or on the bridge to the South Bank. When it’s busy you’ve got to use your judgement when you’re overtaking. I find I often have to lurk behind people. . . and then shoot through the gap. Obviously what you’re saying is controversial. Have you ever been stopped by the police? No, I’ve never had any problems. I’ve had them asking questions when they’ve been looking for a stolen skateboard, but they’ve always been nice about it. ln fact one of them even had a go on mine.